Citation Information: J Clin Invest. 2004;114(12):1704-1713. https://doi.org/10.1172/JCI20427. Caspase-3 is a critical enzyme for apoptosis and cell survival. Here we report delayed ossification and decreased bone mineral density in caspase-3–deficient (Casp3–/– and Casp3+/–) mice due to an attenuated osteogenic differentiation of bone marrow stromal stem cells (BMSSCs). The mechanism involved in the impaired differentiation of BMSSCs is due, at least partially, to the overactivated TGF-β/Smad2 signaling pathway and the upregulated expressions of p53 and p21 along with the downregulated expressions of Cdk2 and Cdc2, and ultimately increased replicative senescence. In addition, the overactivated TGF-β/Smad2 signaling may result in the compromised Runx2/Cbfa1 expression in preosteoblasts. Furthermore, we demonstrate that caspase-3 inhibitor, a potential agent for clinical treatment of human diseases, caused accelerated bone loss in ovariectomized mice, which is also associated with the overactivated TGF-β/Smad2 signaling in BMSSCs. This study demonstrates that caspase-3 is crucial for the differentiation of BMSSCs by influencing TGF-β/Smad2 pathway and cell cycle progression. 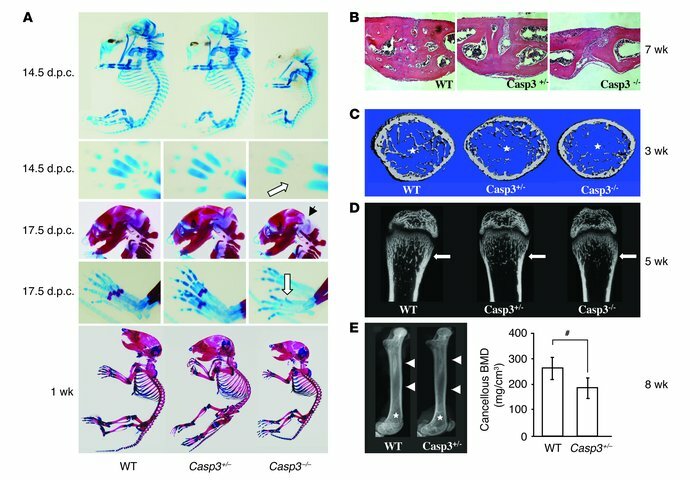 Skeletal defects in caspase-3–deficient mice. (A) Alizarin red and alcian blue staining of mouse skeleton at different stages. Casp3–/– mice had smaller skeletons and showed delayed development in the skull, metacarpi, phalanges, and the sternum at 14.5 d.p.c. (upper panels). White arrow shows the skeletal developmental delay on metacarpi in Casp3–/– mice. Casp3–/– mice show delayed ossification on interparietal bones (black arrow) and metatarsi (white arrow, middle panels) at 17.5 d.p.c. One-week-old Casp3–/– mice also showed a smaller skeleton (lower panel) compared with WT mice. (B) H&E staining on the sagittal suture of the anterior frontal bone at 7 weeks. The suture was completely closed in WT mice, while Casp3–/– and Casp3+/– mice showed a completely opened suture and an incomplete closure, respectively. Original magnification, ×200. (C) Trabecular bone structure of the distal femoral metaphysis at 3 weeks by microCT. Both Casp3–/– and Casp3+/– mice showed decreased trabecular bone formation (asterisks) compared with WT mice. (D) Coronal sections of the distal femoral metaphysis at 5 weeks by microCT. White arrows show the trabecular bone areas. (E) X-ray images of the femora at 8 weeks (left panel) show differences in bone density between Casp3+/– and WT mice, including cortical bone (arrowheads) and trabecular bone (asterisks). Cancellous BMD of the distal femora assessed by pQCT (right panel). pQCT also indicated significantly decreased BMD in Casp3+/– femora. Error bars represent the mean ± SD (n = 4; #P < 0.05).